The 1.98 Ma Laguna Colorada ignimbrite shield lies between the Pastos Grandes and Guacha calderas. Most large ignimbrite eruptions coincide with caldera collapse like at Pastos Grandes and Guacha. However, the Laguna Colorada ignimbrite does not have an apparent associated collapse caldera. Instead, the ignimbrite takes on a shield-type morphology, with effusive lava domes erupting from the apex of the shield covering any evidence for collapse. The Laguna Colorada ignimbrite is easily accessed thanks to its namesake--Laguna Colorada--lying at the edge of the western slope of the ignimbrite shield. The Sol de Mañana geyser fields and Volcan Uturuncu are also nearby. The small towns of Huayajara on the southern edge of the lake and Quetena near the base of Uturuncu are lovely places to spend the night. 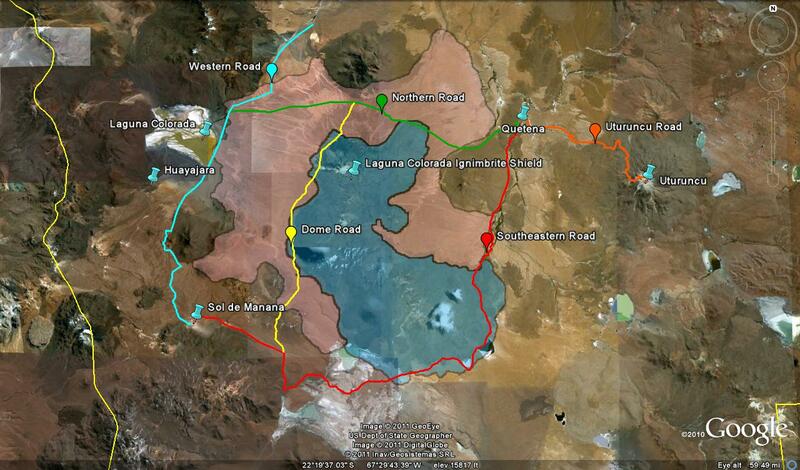 The above map shows the major roads through Laguna Colorada. Pink indicates the extent of the ignimbrite. The blue outlines the lava domes.